We are all busy in our everyday lives and it is easy to lose sight of the need that exists all around us. As healthcare professionals, we feel it's our duty to serve those who may not have resources available to them. There is a vast population of under-served patient’s right here in our own community. Dr. Schuyler makes a concerted effort to remember those in need. She and her husband, along with their collective teams find several ways to serve our community throughout the year. Our team regularly volunteers time at Alberta Rider Elementary, here in Tigard, providing free dental screenings to students who are most in need. We spend our time with the children checking dental health, providing oral hygiene instruction, and discussing healthy nutrition. We were even able to offer treatment back in our office to those in desperate need of care. The best part for us has been having the opportunity to form great relationships with these children, and giving them a positive dental experience. Dr. Schuyler goes out on the Northwest Medical Team van to our local elementary schools, providing much needed dental care and promoting good oral hygiene habits to children with no dental insurance. 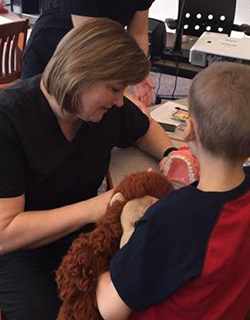 Annually, Dr. Schuyler and her staff participate in the "Give Kids a Smile Day". They either open up their office to children in need, or donate their time and supplies to OHSU School of Dentistry, where several hundred children are treated in a short time period. Additionally, Dr. Schuyler and her team volunteer annually in Portland's "Mission of Mercy" event at the Convention Center. 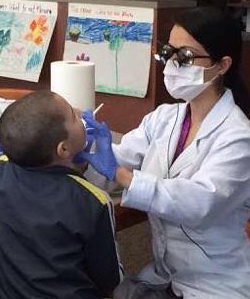 They, along with hundreds of other local dentists and staff provided much needed dental care to patients who could not otherwise afford treatment.